I love dressing up my pets but there are no costumes in the stores that will fit my giant dog. So each year I have to make him one! 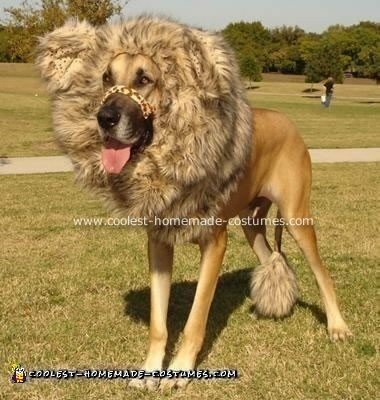 This year he has a lion costume. I went to a wholesale fabric store to get the fur, then to JoAnns to get the rest of the stuff like elastic, hot glue, cotton stuffing, etc. I don’t have a sewing machine so this took me forever to put together! I filled a large rectangle of the fur with pillow stuffing and secured it around his face neck and chest with elastic, but I miss measured (I made it too small) so I had to use a strip of fur going down from his chin to his chest to conceal the elastic. This mess up gave it an even more realistic look! I cut ovals of fur for the ears and the tail. I secured the tail “puff” with vet tape on his real tail. I at first mutilated 3 teddy bears trying to find the perfect ears but none looked right they all looked like mouse ears so I had to sew the ears too. They are from the same fabric but inside out. We are lucky he is already a nice golden color to finish out the effect. Hours of sewing and winning the costume contest at Barktoberfest again, priceless!